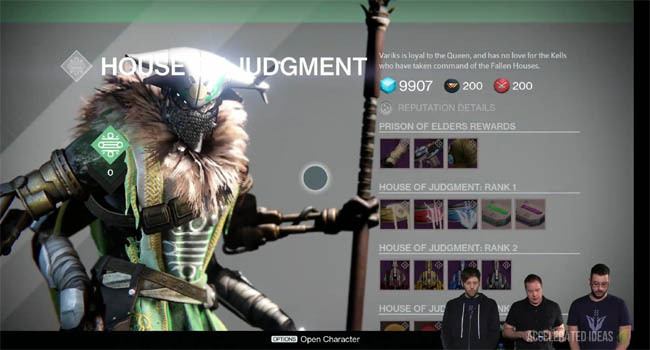 Variks the Loyal is the House of Judgement vendor responsible for dishing out Prison of Elders rewards and House of Judgement gear. 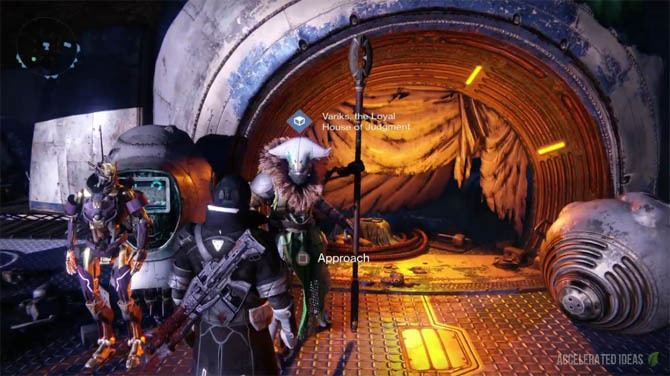 He's located in the new Reef hanger, which is part of the House of Wolves DLC expansion. A basic reputation that you earn by defeating enemies in the Prison of Elders. Obtained by finding chests in the Arena, killing Wanted Fallen and increasing reputation with the House of Judgement. These are rewards for completing challenges in the Prison of Elders end game. To unlock a reward you must have Armour and Weapon Cores. A single Core can be used to purchase a brand new DLC level weapon or amour piece. 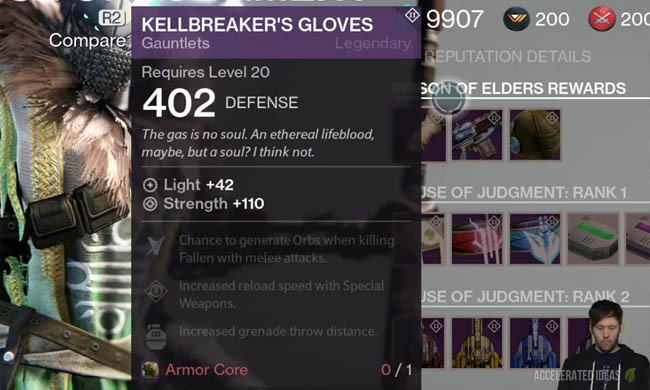 In the image example above, the Kellbreaker's Gloves are a House of Wolves DLC gauntlet. They have a DLC specific perk which generates Orbs when killing Fallen with melee attacks. Another good example of a DLC weapon is Wolfslayers Claw which is a high powered Auto Rifle (a million times better than The Dark Below auto rifles), which has a unique perk that deals bonus damage to Fallen shanks. Other DLC weapons include Wolves’ Leash II (average Scout Rifle), Aegis of the Kell II (average Pulse Rifle) and Six Dreg Pride II (moderate damage, stable Hand Cannon). The final slot of the Rewards section contains the Judgements Chance Package. Like other Packages, this reward can be revealed through the Tower Postmaster giving the player the chance to earn a random House of Judgement weapon or armour piece, hopefully different to the one on sale at the time. This Judgements Chance costs: 1 x Armour Core + 1 x Weapon Core, making it harder to acquire than the other two Reward choices. 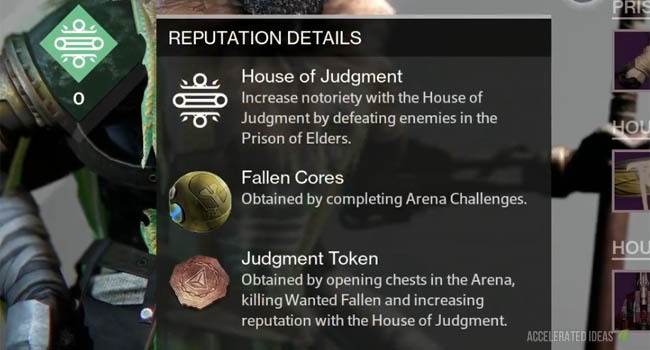 To earn Cores you must complete House of Judgement challenges in the Arena. These challenges refresh on a weekly basis and you can only complete a limited set of challenges per week, in a similar way to you can only earn Raid gear once a week. Completing a challenge will reward you with either a Weapon Core or Armour Core, depending on the challenge you complete in that week. You'll need either of these to collect the weapon or armour piece being offered by Variks in that week. Both Cores are required to use the Judgements Chance package. Arena challenges are the only route to earning House of Judgement Cores. We know that challenges start at Level 28 and progress up to Level 35. Some of the challenges refresh on a weekly basis and there's a lock out preventing you from completing the same challenge twice (except for the low level 28 playlist). Getting to this rank will allow you to purchase class armour and ammo refills. Purchase new DLC ships once you reach Rank 2. You will need a Token of Flight to purchase a ship, which are earned by opening chests and increasing reputation rank. A selection of Shaders is on offer once you reach Rank 3. A Token of Identity is required to purchase Shaders which are earned by opening chests and increasing reputation rank.